Burger King ads have a history of being quirky and many campaigns have led to memorable spin-off viral videos, such as the Whopper Sacrifice Facebook application. The brand's latest product to be promoted is the new Bacon Caesar Angus burger, with the launch of a new campaign on 8 October. The TV ads are set in a doorbell factory where a surprise inspection is about to take place. The foreman inspects the first two doorbells and rewards each worker with a Bacon Caesar Angus burger. The third doorbell has a ding, but no dong, meaning no burger is awarded to the final worker. The ad's humorous approach has appealed to the brand's target audience. When the ad first launched, Burger King's buzz and general impression scores were -4 and -12 respectively, with the overall index score at -12. Just 11 days after the ad first aired, buzz and general impression scores had improved six points, peaking at +2 and -6 respectively. These increases contributed to an improvement in the Burger King's overall index rating, which peaked at -10 on 19 October, up two points since the launch of the campaign. 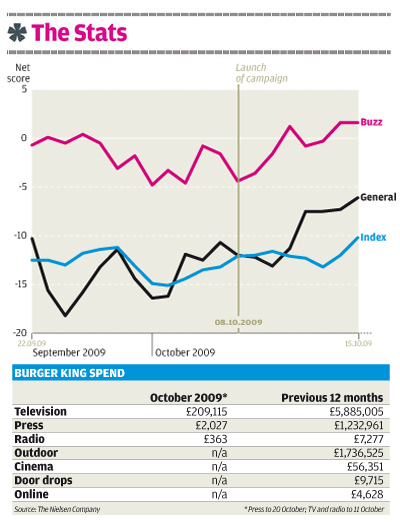 Burger King's rivals cannot afford to underestimate the success of the campaign. Since the beginning of October, the satisfaction scores for the brand have steadily increased and Burger King is now the 12th-highest scoring brand for this indicator in its category - notably above Domino's Pizza and McDonald's. McDonald's has just launched a new campaign and it will also benefit from its sponsorship of next year's FIFA World Cup. In the meantime, Burger King will hope the success of its recent marketing will carry enough momentum to maintain its lead among fast-food consumers.